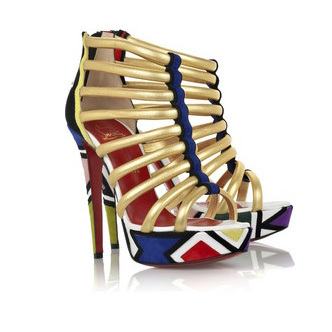 If there is one man who can break any language barrier – it is Christian Louboutin. His shoes are a language that almost every woman can speak. I was able to confirm this on our first night in Cairo. We were leaving the hotel after a quick costume change (after the Souk) to have a picnic dinner on a Felucca ride down the Nile (I will write more about this in a bit). Just after closing the car door, I heard a tap on my window. I rolled it down to discover 3 gorgeous Egyptian ladies peering in. After a few seconds, one of them spoke up, “My friend would like to take a picture of your outfit…particulary your shoes for her blog. Do you mind?” Of course I didn’t mind! I stepped out of the car onto the sidewalk, and Maissa Azab (Fashion Director and Blogger for Enigma Magazine) began to snap images of the shoes and ensemble. She had taken about 3 pictures when we were interrupted by a man in a black suit. He began to speak while pointing to a large black car with a woman’s head poking out of the window, “Excuse me ladies but my client, who doesn’t speak any English, noticed your shoes while we were driving by. She wanted me to ask you the brand and where to purchase them.” I looked over to find Brett and our driver laughing hysterically. Men will never truly understand the bond between women and shoes. Before I could answer the man, the 3 Egyptian ladies began speaking directly to his client in Arabic to answer all of her questions. As it turned out, the other woman was from Saudi Arabia. A huge smile spread across my face as I realized the power of a single pair of shoes. In an instant – 5 women from 3 different countries became pals over platforms. Perhaps we should send Christian Louboutin to the Middle East peace talks. 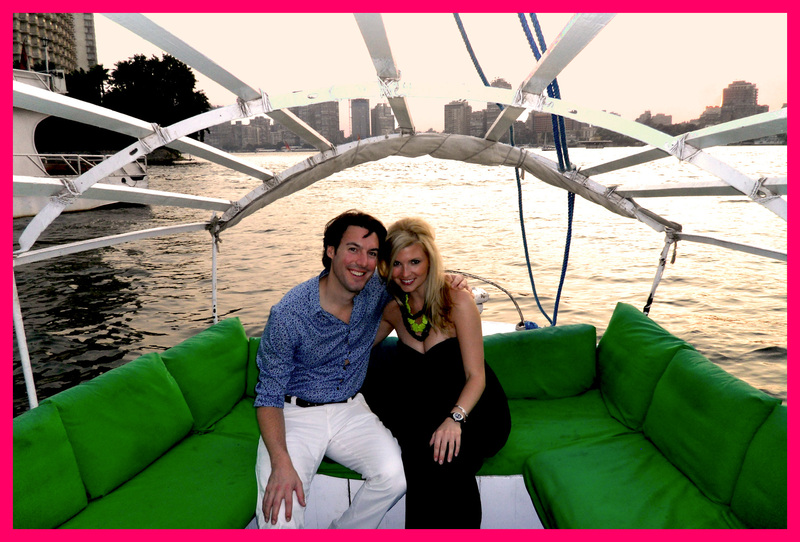 After the fashion detour, we headed to the Nile to hop on a Felucca (a traditional wooden sailboat). The sun was just beginning to set and the views were beautiful. The hotel prepared a wonderful picnic basket for us with a variety of tasty egyptian food and wine. Of course my shoes were not the most practical choice (I almost fell into the river as I was entering the boat) but it was well worth it! dozens of other vessels with tourists taking in the scenery. But something out of the ordinary is what really caught our eye…a Gold’s Gym right on the Nile! I mean – can you imagine if your daily run on the treadmill was overlooking the Nile? TRAVEL TIP: We had a fantastic time on the Felucca in Cairo, however; if your trip to Egypt only allows enough time for one Felucca ride on the Nile, then I suggest that you wait until Luxor. Our experience in Luxor seemed more authentic and picturesque. I will discuss this in more detail in my entries about our time in Luxor. Also, don’t be immediately sold on the big dinner cruises because you think a private boat will be too expensive. 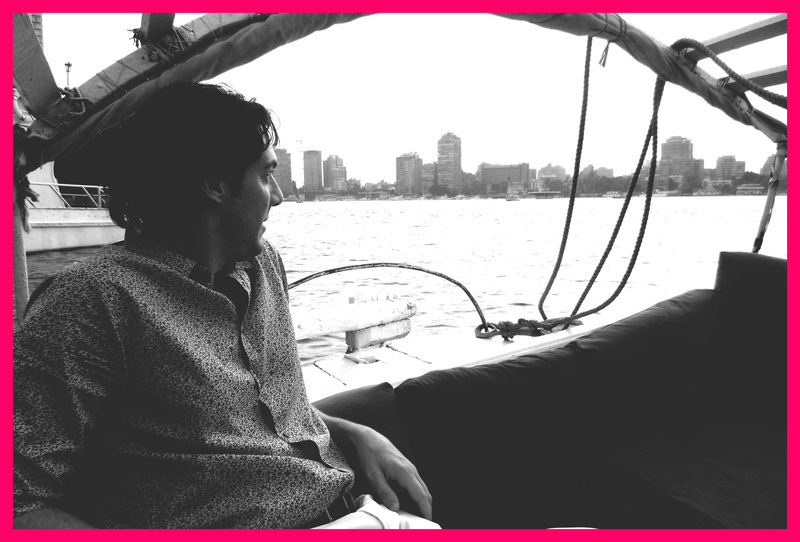 A private Felucca runs less that $50 an hour. You can choose to order food, provide your own, or just enjoy the trip sans snack and beverage. Private is definitely the most romantic option! ← On to the Ancient World….EGYPT! Morgie: I am enjoying reading your daily blog updates all about your Egyptian birthday trip. Speaking of birthdays, I need to wish you a belated “Happy 30th!” It sounds like your trip to Egypt was one to remember. I will look forward to reading more about it in the coming days! Also, I’m looking forward to our short Florida get-away in December. Love you! !